The announcement came as the Iraqi security forces were pushing deeper into the IS-held western side of Mosul. BAGHDAD: The ongoing operations to free the western side of Mosul from Islamic State (IS) terrorists have pushed up to 100,000 civilians to flee their homes, the Iraqi government said on Sunday. 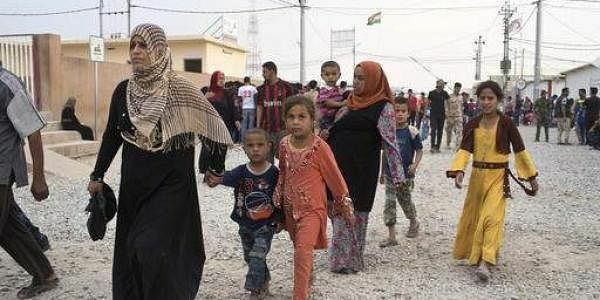 "The latest statistics of the Iraqi ministry of migration shows 99,852 displaced people since the launch of operations to free the neighbourhoods of Mosul's right bank (western side)," Xinhua quoted a statement by Jassim Mohammed al-Jaf, Minister of Migration and Displaced. On Sunday, teams affiliated to the ministry received 10,607 civilians who left their homes from the battleground of the neighbourhoods of western Mosul, Jaf said. The migration ministry prepared appropriate places to shelter the displaced people and provided emergency supplies, including food and medicine, Jaf added. The announcement came as the Iraqi security forces were pushing deeper into the IS-held western side of Mosul, locally known as right bank of Tigris River, which bisects the city. The troops dislodged IS terrorists from several neighbourhoods in the southern part of Mosul's western side, including the main government buildings in the old city centre.